A fast, precise and simple spectrophotometric method was developed for the estimation of uranium in LiCl–KCl salt matrix using phosphoric acid as a complexing agent. The 421 nm absorbance peak of uranium was found to be spectral interference free and area of this peak was used for the quantitative analysis. Linearity over 100–7000 ppm with a detection limit of 25 ppm of uranium in 10% LiCl–KCl matrix was obtained by this method. 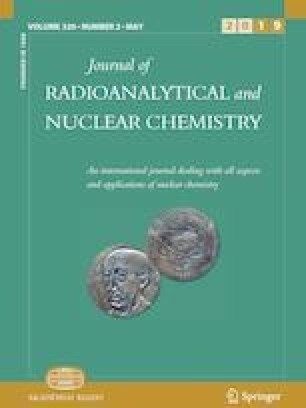 The present method was successfully applied for the quantitative estimation of uranium in synthetic salt mixtures and the results were found to be more accurate than the values measured by ICP-OES. The online version of this article ( https://doi.org/10.1007/s10967-019-06471-3) contains supplementary material, which is available to authorized users. The authors gratefully acknowledge the help of Mrs. S. Annapoorani, Materials Chemistry Division, IGCAR for ICP-OES analysis.